This wooden dial was part of a miner's surveying set, and is made of a block of wood with ivory insets, with the hours engraved on an applied silver ring. 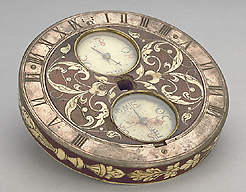 The dial is signed Hans Graf of Gundhalbing in present-day Germany. Nothing is known at present about the rest of the surveying set.